I’ve been working this recipe for almost two months. If you follow my Instagram, you’ve been teased with many pictures. I’ve packed on a few extra pounds because of it, but it was the holidays, so aren’t we allowed to do that? Over the break I learned some family history. Apparently, my great-grandmother used to bake upwards of fifty loaves of bread a week. Yes, you read that correctly. Fifty. Her reason was partly for the need to feed many of her kids, but she also gave loaves to the local hospital each week. To pay off her debt…from childbirth. If only that were an option today. So, after learning this, I felt obligated to get this recipe right. For a simple recipe, it was almost as troublesome as our 2-year-old. Sometimes it came out heavy, sometimes it was still raw in the middle, and sometimes once I forgot the salt and it tripled in size and tasted horribly bland. Once I figured out the ratios, I was baking a loaf daily. I continued to do so for many weeks. This recipe is ridiculously easy and takes roughly ten minutes of actual hands-on time. The hardest part is all the waiting. Trust me when I say it’s worth every painstaking moment of it. It produces a heavy and rich loaf that pairs wonderfully with sauces, can be used as a bread bowl, or just go for straight gluttony by ripping off pieces to dip in fancy olive oil with crushed sea salt sprinkled on top. The lemon peel adds a very faint acidic taste that gives it a balanced flavor. Sift the flour into a large glass or ceramic kitchen bowl, then sprinkle the yeast and lemon peel across the top. Using a wooden spoon to stir, add the water in increments, thoroughly mixing each addition before adding more. You may or may not use all the water.2 Stop adding when your dough no longer sticks to the sides of the bowl but you still need a finger to scrape it off the spoon. This is where the wooden spoon comes in handy! The dough should be sticky enough to give you anxiety if you had dig non-floured hands into it. Leave the dough it in the bowl, and cover with a kitchen towel. Tuck it into a dark corner of your kitchen for 12-18 hours. If you’re unsure, err on the side of 18. I find leaving it alone the longest produces the best bake. If you don’t use your oven prooving drawer for storage like me, this is the perfect place for you to set it and forget it. If you have a drafty kitchen, or if you have limited counter space and it might get moved once or twice during the first rise, I recommend finding a closet or somewhere else dark, and low-traffic, to let it rise. After the first rise, your dough should look a little bubbly and appear larger, if not doubled, in size. Lay a kitchen towel3 flat on the counter and generously sprinkle with flour. You can spread your towel over a cookie sheet to help move it easily if you need to. With lightly floured hands gently draw the stringy dough out of the bowl into the middle of the towel. Make a ball by pulling the edges into the center. It should be pretty sticky but resist the urge to add more flour. Leave it to rise again for 1-2 hours, uncovered. Again, err on the longer side if you can, as the additional time never seems to hurt. Once you can poke your finger in a quarter inch and it springs back it’s ready. In the last 25-30 minutes of the second rise, preheat your oven and Dutch oven to 475°. Make sure to dust the inside of the pot with flour or, if you prefer, cornmeal. Once the ovens are preheated, reform the ball once more by pulling the outsides into the center, and create a seam. Carefully put the dough into the Dutch oven, seam up. Bake covered for 30-33 minutes. Remove the lid and bake another 10 minutes, or until it’s a nice golden brown. The crust will develop outward curls when releasing steam. When the tips of the curls turn dark brown it’s done. Remove from the oven and let it cool uncovered on a kitchen towel. You might be able to hear a very faint crackle as it cools. You can keep a loaf unsliced and wrapped in a kitchen towel for up to two days. Once sliced, store in an unsealed ziplock bag with the open end folded under for up to two days. Ours never lasts long, as it’s usually eaten that day. A long time ago, I started this food/baking blog, and I had my heart set on doing it regularly. Then life happened. Literally. I had a baby girl. Pregnancy wiped me out. I would come home from work, then promptly go to bed. I’d wake up exhausted, and I’d fall asleep exhausted. I tried baking a few times in between, but nothing struck me as anything worth writing over. Then she was here, and my time was literally monopolized between work, my husband, and her. You might recall I joked we had a new sous chef in the house. This meant I was going to start posting again, and I promised more recipes. While I put aside our flour, sugars, and yeast, I was picking up more veggies and using the food processor to make baby food. Being a fairly economic family, we tried bridging the gap between what we made her and what we ate. However, nothing came from it, and anything that went into our mouths worth sharing never went onto paper. So I let you (perhaps one person? Hi, mom!) down, and I let myself down. This blog was an outlet for me. It was a place for me to enjoy food, and share anything I discovered to be delicious. While I don’t actually have any training, I am human, and we all eat, and as a human, I dropped the ball. So this is actually my official jump back into the waters, and I offer up a pretty simple, yet yummy, recipe to make up for lost time. Begin by using a pre-seasoned cast iron skillet, and generously coat the inside with a layer of butter. It helps to put it on the stovetop on low and running a stick around the surface as it heats to create a nice buttery layer on the sides and a thin puddle along the bottom. Preheat the oven to 375º and turn the stovetop off. Let the skillet sit on a cool burner as you go onto the next steps. Begin slicing each potato into 1/8″ or 1/4″ slices. Depending on how efficient your oven is, you may want them sliced on the thinner side. Our last place had a low energy oven, and they took a LOT longer to become edible when using larger slices. Our current oven is much more efficient with the heat. As you finish slicing each spud, gently fan them along the outside of the skillet walls continuing inward until you reach the center. If you have extra slices or end pieces, you can use them to fill the cracks and holes along the way. Once the entire inside of the skillet is covered use your palms to gently press down on the slices to make sure it’s evenly spread. Generously drizzle the surface with olive oil. It’s okay to notice it pooling at the bottom, but you shouldn’t see it if you’ve spread the potatoes across the surface correctly. You also shouldn’t have any sitting oil along the topside. * Sprinkle the top with paprika, oregano, salt, and pepper, plus one more final drizzle of oil to seal any gaping or dry areas. I like to sprinkle dry roasted garlic that’s finely chopped across the top to help season, but it will taste just as divine without. Pop the skillet on to the top rack of the oven for about 20-25 minutes. Check on them every 3-5 minutes after to see when they begin to turn golden brown on the uppermost tips. After they begin to brown, turn off the oven and let them sit with the door closed for another 5-10. Pull the skillet out, spoon a healthy serving onto your plate, and enjoy! EXTRA BONUS: We like to sprinkle a little shredded mozzarella or parmesan on the top just before you turn the oven off, and let melt before serving for a cheesy perk. The sound of summer is screaming for frozen treats. I can’t go a day without hearing the ice cream truck bells or seeing the long line stretching from the custard stand order window. The heat and humidity begs to be challenged. I’ve grown far to comfortable behind my desk job surrounded by the ease of too cold air conditioning. Personally, I love a frozen fruit anything. I grew up in a family whose earlier generations made their living with fruit stands, so when I want a sweet treat I lean the way of produce. In our freezer, it’s fruit popsicles, sorbet, and the occasional sherbet. 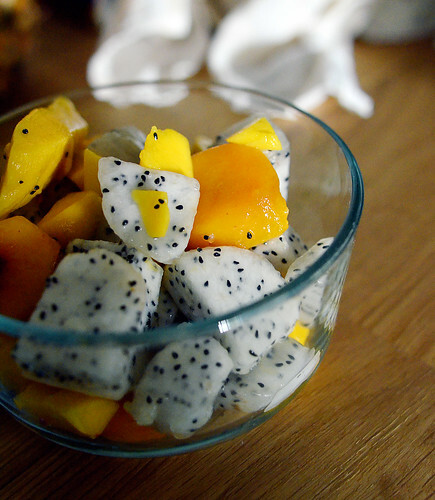 When I recently came home from the store with dragon fruit and the ripest of mangos, I knew I wanted to make something sweet and summer friendly out of them. In a medium saucepan bring water to a boil. Slowly stir in sugar until it has dissolved. Once the water is clear, stop stirring and simmer uncovered for 5 minutes. Transfer syrup to a bowl and let cool, uncovered. Once the sugar water is no longer steaming, refrigerate overnight. I sealed mine in a plastic container with a lid and actually didn’t get to it for two days. Clean the fruit and cube the flesh. Drop the chunks into a bowl with a lid, or simply seal them up in a ziplock baggie. Toss them into the fridge overnight. If you want, you can do the fruit prep on the day you make the sorbet by putting it in the freezer for 4-6 hours before the purée step. When you’re ready, purée the fruit in a food processor until smooth. 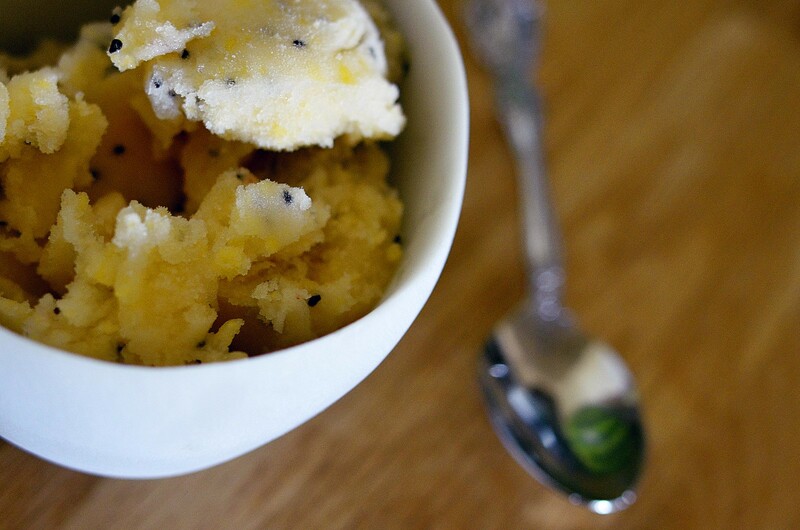 If you like fruit chunks in your sorbet, you can always play around with this process. 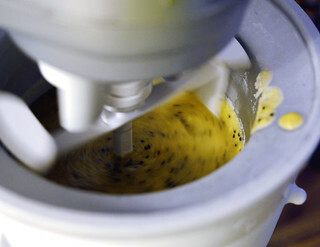 Pour your sugar syrup mix into the ice cream bowl attachment for your stand mixer and turn the mixer to speed 1. With the machine still running, slowly pour in the fruit mixture. Churn for 20 minutes until you begin to see sorbet results. For a firmer texture, remove mixture from the bowl and place into a sealed container. Freeze overnight for a firmer consistency. You can pretty much use any kind of fruit for this, as long as you purée it. You could even leave a few chunks of whole fruit in if you like your sorbet on the rugged side. You can even play with the fruit to syrup ratio, but I find this balance makes for a nice consistency. No matter what, always have more fruit than syrup. First, this speakeasy is literally a mile from my door, and never knew. Well, I never knew, but somehow, my husband had been there before. Second, you can’t get in without having reservations. You can’t get reservations without texting a phone number, and you can’t get the number unless it’s given to you. IF you manage to get in, you can only leave through the back entrance… It’s all very trendy and a tad hipster in theory, but I was pleasantly surprised when we sat down. The space is limited to a handful of people so it isn’t overly crowded, it was super cozy, and the drinks were superb. We each got something different and of course shared sips. I also had a free taste of the Sam Adams Utpoias, and for my nerdy beer side, that was worth the hype alone. 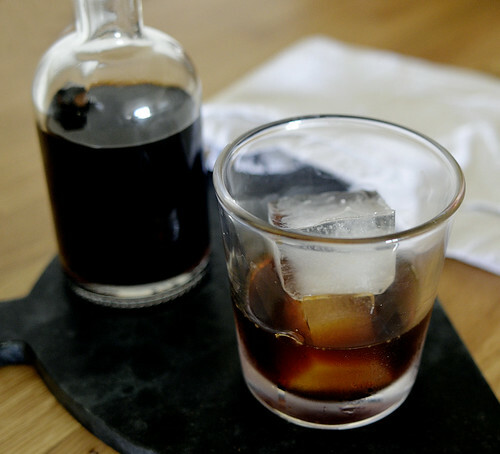 My husband ordered a bourbon drink, and when I sipped, I knew I wanted to recreate it at home. It also had a snippet of a vanilla bean pod in the bottom, to which I tried convincing my husband to let me smuggle out. Have you seen the price of whole pods at the store lately? Plus, it was soaked in bourbon, so it would probably add an amazing flavor to anything you used it in. Alas, he didn’t buy it so I noted the idea to try it at home. His drink however, was still lingering on my palette and I quickly snapped a pic of the menu listing the ingredients so I could fiddle at home. I know, totally weird, but don’t tell me you haven’t done the same. So the drink listed bourbon, burnt sugar, smoke and vanilla. I’m assuming the vanilla was considered the pod soaking in the bottom, so I ruled out vanilla extract. It was mild, but I know what a good vanilla infusion can offer, so I wanted to mix it in somehow other than wasting a bean pod. I never knew burnt sugar was a syrup (completely naive of me, I know) nor did I know how it was made, so I turned to google. Melt sugar, add hot water, and stir until smooth… That’s it! Not really, though. Okay, that’s the standard online recipe. I researched a lot. None of my cookbooks had a go-to recipe, and I didn’t want to wing it. Do I use white sugar, raw, brown? Do I use equal parts water to sugar? Does the water have to be hot, cold or room temperature? My head started spinning. I tried searching online for what the best choices were, and became more confused. Finally, I spent a good hour reading the sugar chapter in my On Food and Cooking book*. 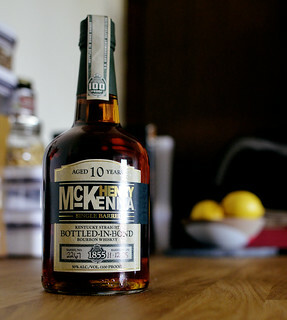 I opted for brown sugar, because I wanted to compliment the earthy tones of the bourbon, and I wanted a complex flavor. I also wanted to infuse the vanilla somehow. *If you don’t have this book, I highly recommend picking up a copy. It’s super nerdy and scientific, but if you find yourself in the kitchen trying to decide between ingredients or finding a substitution, it will pay for itself. 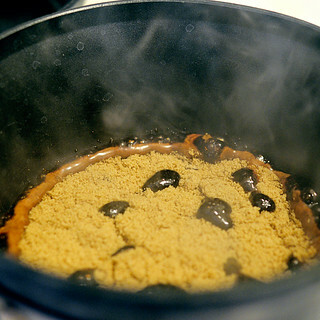 Begin heating the sugar in a small saucepan over medium/high heat on the stove. Make sure it’s spread it evenly across the bottom and resist stirring. It will begin to darken on the edges and bubble in the center. Once it begins to bubble and steam, stir occasionally to incorporate the unmelted sugar. When it has become mostly liquid, keep the heat on, but remove the pan and keep stirring. Slowly pour in the hot water as you stir. It will seize up and bubble as you add it, so do a little bit at a time. I heated my water up in the electric kettle next to the stove, so it was the perfect temperature. Too cold and it will make the melted sugar harden and you won’t be able to stir. Once all the water has been added, return to heat and stir slowly until it’s no longer bubbling and smooth as glass. Remove from heat and pour into a heat safe jar to chill. You’ll want an air tight lid for this jar, but don’t seal it yet. 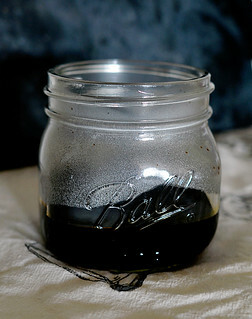 Take the paste from half a vanilla bean pod scraping, and put into the jar with the syrup. With a fork, whisk the liquid to break up the vanilla paste as much as you can for roughly a minute. Put on the lid, and give it a good shake for another minute to finish incorporating the vanilla. It won’t need to be completely mixed in, as the vanilla will still release its oils over time. You want it mixed just enough so you aren’t pouring clumps when you add to the whiskey. Place it in the fridge to cool. You can make this ahead of time and store it in the fridge for up to four months. Outside of using it for cocktails, there are some amazing recipes that call for burnt brown sugar, or you can drizzle a little on top a slice of pound cake. It’s truly versatile and you will use it before it goes bad. You can also increase or decrease the recipe as long as you don’t overpower the syrup with too much vanilla. Just keep the water and sugar amounts the same for any volume, and if you want, leave the vanilla out completely. You can also forego the vanilla altogether, but trust me, it’s an addition you’ll want to keep once you smell the amazing scent that permeates your kitchen after making it. Place bourbon and water into the cocktail shaker. 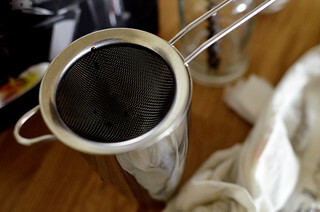 Over a small fine mesh strainer, pour the burnt sugar syrup to catch-all the floating vanilla bits. Cap the shaker and shake for 5-10 seconds. 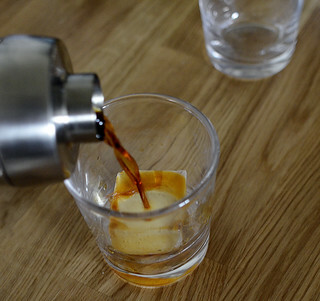 Pour over a large ice-cube in a cocktail glass of your choice. I f you want to try the smoked version, you’ll need a handheld food smoker. I don’t like sticking the rubber hose directly into the shaker, so I poured mine into a glass with an ice-cube, and placed the glass inside a gallon sized ziplock bag. Seal the bag just enough so you can stick the nozzle of the smoker inside and fill with smoke for a few seconds. Turn off the smoker and seal the bag completely and let sit for 5-10 minutes. You’ll see the smoke settle on top of the glass quite a bit. Once you’re satisfied, remove from the bag, and find a cozy place to kick back and relax. My father has always been an early riser. Most days I wake fairly early, but he has a knack for being up before the sunrise on any occasion. When I was little, he would sometimes surprise the whole family by driving fifteen miles into the nearest town and picking up doughnuts fl. If he was feeling particularly generous, he’d go to the bakery and get the fresh-baked doughnuts and pastries. I remember waking to see the box on the counter and peeling back the parchment paper to see what delicious goodies he had brought home. Those mornings were some of my favorite childhood memories. Today, I only get doughnuts at the office, mostly mass-produced and standard glaze. It’s not the same and I normally opt out. I love a good doughnut, don’t let my previous comment fool you. I would just rather have something made with love that didn’t have help from major machinery. I’d go as far as to say you can taste the difference, but I know most people wouldn’t agree. Sometimes you just want a really good, homemade doughnut, am I right?! I was craving that deep-fried pastry for a few days, and I was wasn’t going to let anything get in my way. I knew from my churro adventure that I could and wanted to deep fry the dough. I had just discovered a heck-of-a-bargain on an artisan cast iron skillet at TJ Maxx, and I was itching to break it in. I also knew I wanted a yeasty doughnut that had a soft exterior and fluffy interior. I set to work on building a recipe. Knowing that cake flour leads to more tender dough, I used two types of flour, combined. To add a bit more structure, I combined all-purpose flour with cake flour. I assume you could try it with one or the other; if you like a more firm doughnut, I’d go completely with all-purpose or bread flour. I also have an option for two rising methods. One is for those impatient like myself, while the other is for the planners who want a want to spend less time making breakfast. Doughnuts are not for the person searching for a quick morning fix, however, they are well suited for a lazy weekend. In a small sauce pan, warm the milk on the stove. You’re not making it hot; you should be able to put your finger in without burning. If it steams, you’ve heated it too much. In a large mixing bowl, whisk the yeast, sugar and milk together. Set aside for 5 minutes until it begins to foam. Add in zest, yolks, and vanilla scrapings and whisk until the yolks are incorporated. Add butter and whisk until it’s mostly broken up. In a separate bowl, whisk both types of flour together. Add half of flour into the large mixing bowl with the liquid ingredients in it, and stir until combined. If you’re using a stand mixer, use the lowest setting and a dough hook. Then, add the rest of the flour and salt until it begins to form into a ball that’s smooth and stretchy in texture, about 5 minutes. If you must up the speed, don’t go higher than the third setting on your mixer. If it sticks to the side of the bowl, add a little extra flour, but only a little at a time. The more flour you add, the tougher your doughnuts will be in the end, so use your best judgement. A little sticky isn’t all that bad. Lightly oil the inside of a large bowl and place the dough inside. Cover lightly with plastic wrap and let rest for 1-1 1/2 hours at room temperature. It should double in size. I actually doubled my recipe to share for later, then I forgot I doubled it when it came to rising… I ran into a ‘we’re gonna need a bigger bowl’ situation. It was quite humorous, but I worried it would dry out a bit too much with the plastic wrap lifting, so I kept tucking it in. I lost a bit of surface dough from the plastic being a bit too tight on the top, so be mindful of your bowl size! On a lightly floured surface, softly roll out dough to a rough 1/2″ thick. With a round cookie cutter, cut circles into the dough. Continue grouping up the scraps into smaller balls, and re-roll into another mass until you don’t have enough to cut anymore. You can use the scraps later to test the oil. If you want traditional holed doughnuts, use a smaller cookie cutter to slice out small holes from each center. Loosely cover the doughnuts with a tea towel and let rise for another 30 minutes at room temperature. In a large mixing bowl, whisk the yeast, sugar and cold milk together. Set aside for 5 minutes until it begins to look slightly foamy. Add in zest, yolks, and vanilla scrapings and whisk until the yolks are incorporated. Add butter and whisk until it’s mostly broken up. In a separate bowl, whisk both types of flour together. Proceed with the same process of mixing as the same day method, then place in a large oiled bowl, cover with plastic wrap and let rest in the fridge overnight. The next day, roll out, cut and let rise, covered in a tea towel, for 30 minutes. Heat 2 inches of vegetable oil to 350°F/175°C in a cast-iron frying pan or heavy pot. If you don’t have a kitchen thermometer, this is where the scraps come in handy. You can practice and get an idea of how quickly the dough will cook. It should sizzle and brown quickly when you put it in, and brown evenly when you flip.I had a little fun with the scrap pieces by softly forming them into random shapes. One at a time, add a doughnut to the oil with a spider strainer or on a piece of parchment paper, wearing an oven mitt. Watch your hands! they can spit droplets of oil, so just take precaution to avoid burns. Cook the first side until deep golden brown underneath, roughly 10 seconds, and keep a close eye on it. Flip and cook the other side until golden brown, then remove and spread out on a paper towel lined cooling rack to absorb extra oil. Repeat with the rest. When cool enough to handle, you can fill the doughnuts you didn’t cut the center out of from the tops or sides. I used a meat injector and some homemade lemon curd. with a fine mesh strainer, shower doughnuts with powdered sugar, or roll the doughnuts gently in a bowl of it. If you’re feeling fancy, you can find many glaze recipes online, or melt a little butter, lightly brush the tops and sprinkle with a hint of Swedish pearl sugar. You can store these in an unsealed container overnight as well, but they are much better the day of. You might need to re-powder the tops in the morning, as the sugar will absorb with the oil. I grew up in a family that always had a loaf or two on hand. When mom was feeling particularly fancy, she’d get a french bread loaf in the paper bag at the deli to serve with a meal. I loved the crispy outer crust, with the soft, airy inside… If it was affordable to buy for all our bread needs, I would. When I moved to Kansas City, I discovered the Farmer’s Market, and the fantastic Italian grocer on the border of the River Market. I’d make a trip every weekend to downtown and always at Carollo’s Grocery to get some sliced Prosciutto Di Parma and at least two loaves of the fresh-baked Italian bread. It was devoured within a day or two, followed up with a week of exercising double to burn off the totally worth it carbs. Over the years, I’ve made many breads in the form of desserts. I have no idea why it never occurred to me to bake our own bread loaves… Why had I never tackled this so-simple task? My husband took the opportunity to make a roast, one of his specialties, so I decided to compliment the meal with bread perfect for soaking up the last bits of broth and wiping the bowl. On a large, clean surface form the 3 1/2 cups of flour into a mound with a deep well in the center. Sprinkle half the salt into the well. In a bowl, mix the yeast, honey and water using a fork to whisk until it begins to foam. Slowly pour into the flour well, and mix the flour from the sides into the liquid with a fork until you get a clumpy texture. Sprinkle the remainder of the salt across, then using your hands, form the dough into a ball. Knead for 15 to 20 minutes until soft and smooth. Dust the surface of the ball with a pinch of flour, and place the ball in the bottom a deep bowl coated with a light layer of olive oil. Cover with a tea towel and set aside to proof, away from any drafts. Depending on how warm or cold your home is, you might need to peek under the towel to see how it’s doing. You can let it proof for up to 3 1/2 hours, but no less than 2 1/2. Once the dough has risen to double its size, preheat the oven to 480°. The surface that wasn’t in contact with the bowl will have a slightly dry crust, but all you need to do is knead a few minutes until soft and smooth on a lightly floured surface. Lay the tea towel over the top and let it proof for another 10-15 minutes. After the second rise, pull and stretch softly to make a rectangular shape. Take care not to over-handle the dough. Roll the dough from one long end of the rectangle to the other, forming a loose spiral on each end. The edge of the roll should be resting on the side. Dust the top liberally with flour, and softly cut slits or a cross pattern in the top with a serrated knife. Cover with the tea towel once more, and set aside to rest for 5-10 minutes. Line a baking tray parchment paper, and lightly dust the surface with the leftover flour. Pop into the oven on the center rack and bake for approximately 30-40 minutes, depending on your oven’s efficiency. The oven light will prove important here. You don’t want to crack the door to look in, the heat must remain constant. Your home will fill with the aroma of baked bread, but don’t be tempted to open the door and peek. My dinky oven doesn’t have a light, and I risked a slightly over browned crust for the full 40 minutes. This recipe results in a hearty, dense dough, but the outer crust protects it well. Next time I’ll take it out at 30, but even if you over brown the crust, the dough on the inside won’t burn. Take it out of the oven, and quickly transfer it off the baking pan, and onto a tea towel or cutting board to cool. You’ll hear the surface crackle and pop. Once it no longer makes any sound, it’s ready to slice. If you cut into it while still crackling, you’ll let moisture out early. It should come to a rest and be silent before indulging. Our roast dinner was perfect, and we both contributed! I stored the remainder of the loaf in a ziplock bag. In the morning, I used some homemade lemon curd smeared on a slice… forget dieting, I’d rather do this every day. The bread keeps for at least 4-5 days after it’s been cut, and up to 8 days if you haven’t. You could easily make enough loaves to satisfy your bread needs for a week. I never want to buy bread again. It’s so easy to make, and you can tackle other things while waiting for it to proof. I’ve always loved lemon flavor. It’s the best combination of citrus and tart that make your mouth vibrate! It’s also one of those flavors that transcends to another level when you add an additional ingredient. The possibilities are endless. I’ve made many pastries that call for a fruit curd, mostly lemon. I’ve bought the tiny jars of curd at the store, and they always seem slightly overpriced. When I found my pantry in stock of everything needed to make it from scratch, I knew I wanted to create the perfect lemon curd! 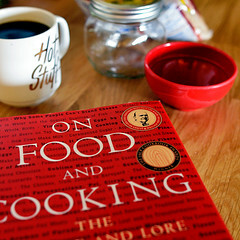 I spent a good hour studying my On Food and Cooking book. I compared notes from various recipes to make a combination of ingredients that I felt had the best quantities and flavor enhancement. I loved the idea of adding sage from Savory Simple’s version, but I really wanted to taste it, so I upped the amount. By the time I was ready to make it, I felt confident that I could fix mistakes along the way. * I like a thicker curd for tarts and other uses. If you prefer a runny curd, skip the cornstarch, and maybe forego an egg yolk as well. I started by squeezing the life out of lemons to get the most juice into my measuring cup. I recommend using a juicer, or a lemon press, neither of which I have. I was hand squeezing mine over a bowl with a fine mesh strainer. It took 5 medium-sized lemons to get 1 1/2 cups, at which point my hands were feeling the burn. In a medium saucepan, whisk the eggs, 4 egg yolks and sugar until smooth. Turn on the heat to medium/medium high, and begin stirring in the lemon juice until well blended. Once smooth, sprinkle cornstarch across the top as you stir, little by little to avoid clumps. You should have a smooth, liquid that looks watery, but keep stirring to avoid burning the bottom. Add the sage leaves, making sure to submerge them completely. Once the surface starts to steam, add the final egg yolk, whisking briskly. It will appear runny until for a while, but will eventually start to firm up. Depending on your heat setting, you could be stirring for 20 minutes. Plan ahead. Remove from heat, and keep stirring. Drop in a few cubes of butter at a time, whisking until completely melted before adding more. Once all the butter is mixed in, transfer to a large bowl and let it set for 10-15 minutes to cool. If you can put your fingertip in, for a quick taste, take a piece of plastic wrap and lay it across the whole surface leaving no air so it won’t form a skin, and pop into the fridge for at least 2 hours. A LOT of my recipes require waiting. I love instant satisfaction in the kitchen, but there is something to be said for the things you have to wait for. It’s what totally makes it taste better. I swear. it’s a little science, and mostly will-power. After cooling for the allotted time, remove the plastic wrap and taste test… It should be tart and sweet all at once! I love sweets, and this was a little too sweet for me, so I actually stirred in a pinch of my favorite Himalayan pink sea salt to help mellow the flavor. You could even make a preemptive strike by using salted butter, but I have a feeling you’ll get too much salt. I spooned the mix into two half pint mason jars. I pulled out the sage leaves as I went, leaving in a few tiny specs in to enhance the flavor even more. Some suggest storing it with a piece of plastic wrap on the surface to avoid it forming a skin on top, but I have found that if you seal it air-tight, the skin is minimal, and it dissolves with stirring for a moment or two. Serve on toast, inject into cupcakes, fill a pastry, or make a tart! You’ve just made lemony heaven, your possibilities are endless. This makes quite a bit of curd, but it’s perfect for sharing. Let me know what you make with it, I’d love to swap recipes. Trust me, I’ve had plenty. As someone who loves sweets, and dislikes most chocolate, I’ve tried my fair share of sugar cookies. I scoured the internet, cookbooks from the last 35 years, and family recipes to perfect my sugar cookie game. It all came back to the basic recipe. I live in a house of sweets-lovers; if things aren’t made from scratch, we more-than-likely know the best place in town to procure them in-a-pinch. That’s why I stuck to a classic recipe. You’ll find this recipe all over, in various forms. Give or take a teaspoon here, plus or minus half a cup of one thing or the other… it’s out there. If you find a new innovation in sugar cookies, let me know. I’ve found, through trial and error, the best way to secure a delightful version relies in the bake time. Yes… again, timing is everything. Just like the real brownies recipe I created, patience and timing make the difference. You have to mix then wait to cool, bake then wait to cool again. They are delicious as is, but as a cherry on top, you can make a warm icing, in batches so it doesn’t harden before you can finish, to ice these sugar cookies. It’s a labour of love, but you’ll be loved to the utmost for sharing. Makes 30-40 1 1/4″ cookies. *You can make an almost identical cookie with 2 3/4 – 3 cups of all-purpose flour. Most recipes call for all-purpose, but I default to cake flour as it’s always light and airy when baked. If you see a recipe that calls for all-purpose and you substitute cake flour, you’ll need to up your amount just a tad. Always start with the smaller amount because you can always add more; it gets tricky trying to add wet ingredients. In a mixer bowl, whisk 3 cups of flour, baking soda, and baking powder together. Cut in butter with a pastry cutter to blend until the mixtures is in small, clumps and pieces, then scoop into a KitchenAid Mixer bowl. In a separate bowl beat eggs, sugar, and vanilla until mixed. With the mixer on low, slowly pour into the dry mixture. On medium speed, mix until all wet and dry ingredients are combined. It should look and feel like slightly tacky play-dough. If you can put your finger in without any sticking, you’re good to go. If not, this is where the extra flour comes in handy. Add a tablespoon at a time until you can use your hands to form dough into a ball. Once it’s the right texture, cover in plastic wrap, and pop into the fridge for 30-40 minutes. Wait. Really, wait. If you need something to do, clean off a large space of counter, and lay out a sheet of wax paper. Take some flour and sprinkle on the surface and spread it into a fine coat. You’ll roll out on this, and save on clean-up later. In the last 5-10 minutes, preheat the oven to 375°. Once your dough is stiff and cold, grab a handful sized hunk and leave the rest in the fridge. Roll the dough to roughly 1/4″ thick, and cut into with a round cutter. Mine stuck in the cutter long enough to move onto a parchment lined baking sheet where I pushed it out with a fingertip. I spaced them roughly 1/4-1/2″ apart, because they didn’t grown much. continue until your batter is gone or your sheet is full. I had a TON of leftover batter by the time the first sheet was filled, so prepare to make these in batches. Pop the tray into the oven for 5-7 minutes. Too long, and they’ll brown and harden too much when cool. This can vary by your oven, so keep an eye on them. Most people say until the bottoms are brown, but I disagree… If they look like puffier, same color versions of when you put them in, they’re good. This is the ultimate test to get good cookie texture. They’re still soft when you bite into them, but also firm and cakey. Take the cookie tray out of the oven, then slide the parchment paper with cookies onto a cooling rack, while you get the next batch ready. Repeat the same process as before. When you get the next batch in the oven, you should be able to take the first batch off the rack and set aside for icing later. Once all your cookies are baked and cooled, you can either take a break or move on to the icing process. If you wait too long, someone might eat what you’ve already made. If you’re generous, you’ll want to double this recipe. *I find that you can cut off the tip of a pod and run the back of the knife from the top to the cut end a few times successfully getting most if not all the bean paste out of the pod. Heat butter and water in a saucepan on low heat until all the butter is melted. In a glass bowl, put in all other ingredients, and make a well for the butter/water mix. Pour in the liquid, and with a hand mixer, work until smooth. It should still be warm when you’re done. Using a small icing spatula or a butter knife, ice away, friends! Be quick about it… I used a small tablespoons worth of icing per cookie, quickly moving from one to the next until the icing started to stiffen. If it starts to pull up with the knife and away from the cookie, it’s getting too hard. Instead of adding more water, put your bowl of icing into the oven on warm for 5-10 minutes, then take out and stir vigorously before continuing to ice the rest of the cookies. Once they’re iced, set them out on the cooling rack or another sheet of parchment paper for at least an hour. The icing should be hard to the touch when you’re ready to store them… that is, if they make it that long. When they’ve sat long enough, you should be able to stack them without any sticking or smudging the icing. This recipe makes plenty for sharing… and you can always forego the icing and dust with powdered sugar, or many other things. I’ve heard of people adding lemon zest to their dough, and that might be perfection, but my household loves these as is. Feel free to get creative with your cookie cutters and frosting. I always feel that simplicity compliments a good recipe. This is one of those classics that can stand on it’s own.